Montreal is known for some really good food. And I mean R-E-A-L-L-Y good food. So we were very excited to check out some of the best this city has to offer. I had my camera for most of our culinary outings so I could share them with you. 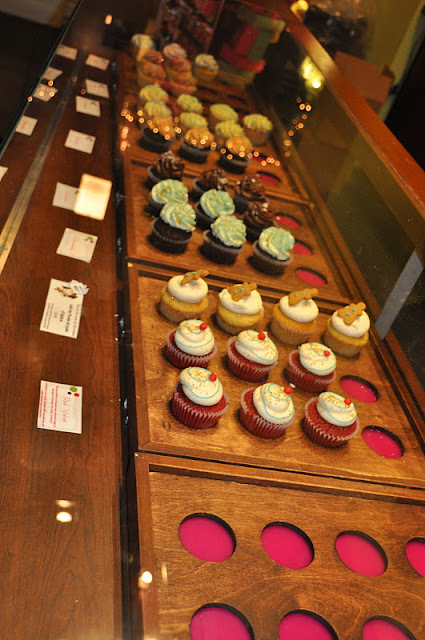 Here are four of my favorites (the best cupcakes, the best bagels, the best breakfast, and the best smoked meats)! This place has beautiful cupcakes. But, more importantly, they are delicious. Seriously, better than any cupcake I have had in New York City (and there are a ton of cupcake places in NYC). We tried a lemon cupcake with lemon frosting, a vanilla cupcake with vanilla frosting and a red velvet cupcake. All were yummy, but my favorite was the classic vanilla. The cake part is so moist and flavorful, and the frosting is rich, sweet and creamy. Some might think that they are a bit pricey at $3 a piece, but once you taste one, you will without a doubt think that they are worth the price! You will love these cupcakes if you are a cupcake person. Look at the smiles on our faces (all sugared up and in "heaven"). This place is the real deal folks. Now, just so you know, bagels in Montreal are very different from bagels in New York- but, they are good in their own way. Bagels in Montreal are more dense, less fluffy and sweeter than New York bagels. They are also crispier on the outside because they are cooked in a wood-burning oven. Basically, a Montreal bagel is a cross between a pastry and a bread- and it is good enough to have just plain. Just so you know, the most popular bagel flavor to order in Montreal is the sesame. 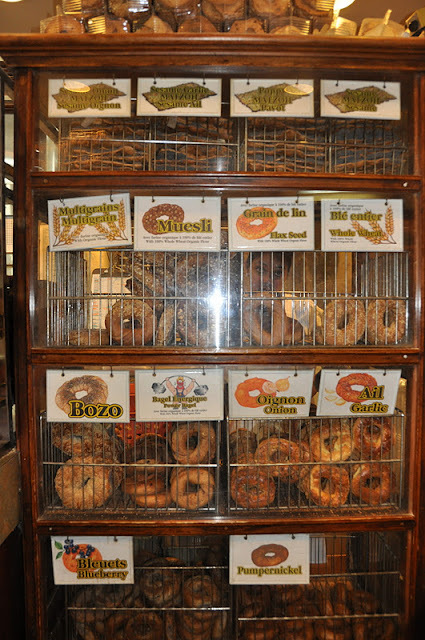 In fact, 70-90% of the bagels sold in this city are sesame! 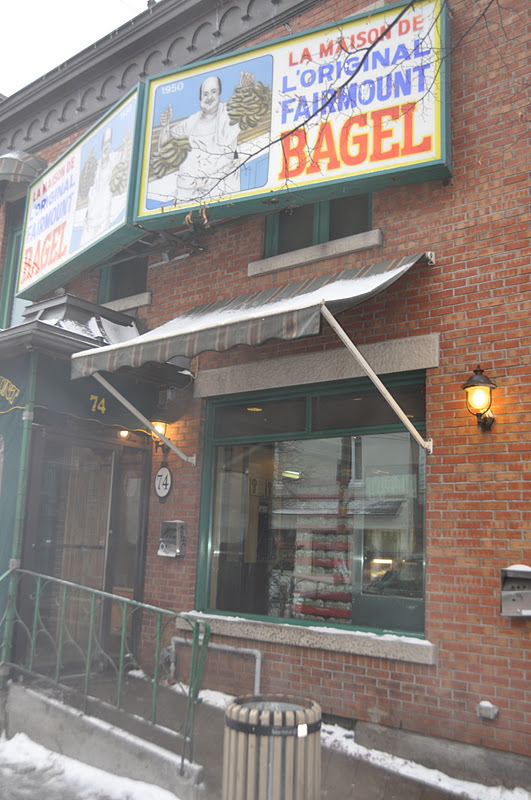 FYI: You will hear a lot about St. Viateur's Bagel also in the same neighborhood. We tried their bagels too, but preferred Fairmount much more. St. Viateur's were not as sweet, and their everything bagel had no salt on it, which for me is a big let down. You may look at this picture of the outside and think "what's so special about this place?" But, I'm telling you, once you spot the line trying to squeeze its way into the very tight doorway (expect a good 25-35 minute wait on the weekends), you will surely understand why. This place is a Montreal institution/ landmark. Beauty's has been serving food since 1942. It's often referred to as the grand daddy of Montreal Brunch spots because it is a place you MUST visit when jet setting to this city. The decor is similar to an old diner, yet sort of updated and very well kept. Now on to food and what to order. 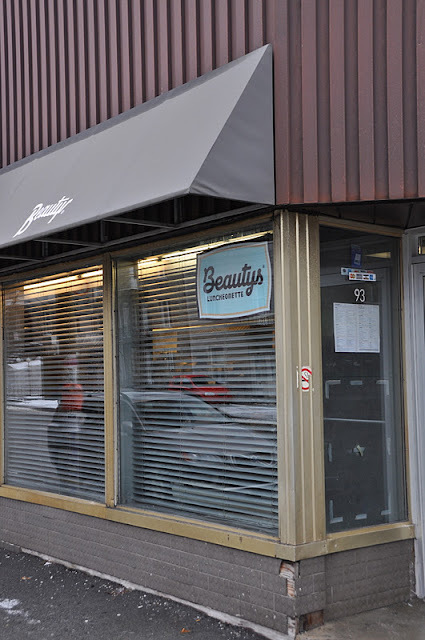 Beauty's has a very large menu, but is known for two things- (1) The Beauty's Classic: a smoked salmon bagel with cream cheese, tomato and red onion. The bagel is toasted, the cream cheese and salmon are fresh, and the tomato and onion are well proportioned. It's delish. And (2) The Mish-Mash omelet made with hot dog, salami, green pepper and onion. It might sound a bit weird, but it's amazing! The meats work together so well to give it just enough of a salty flavor, and the green pepper and onion in it remind me of a western omelet with a twist. What an awesome creation! This is the place to order smoked meats (something Montreal is certainly known for). 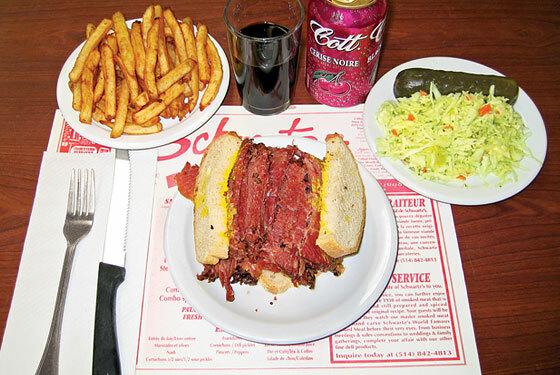 Schwartz's has been serving smoked meats with the original recipe since 1928. This place rocks! 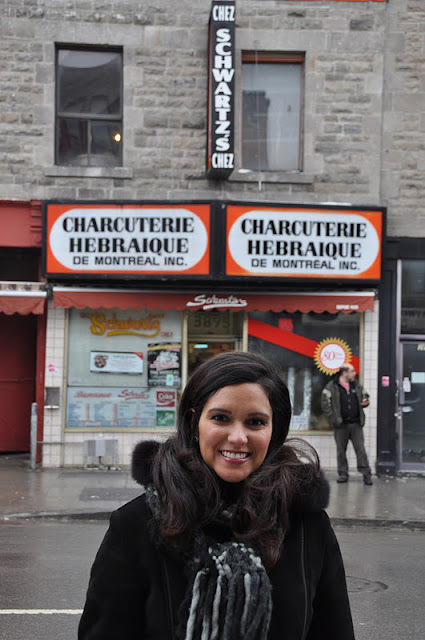 Schwartz's is a must try for all people visiting Montreal. It's a place you'll very quickly find yourself craving and missing more than you can imagine. Here's what to order: Smoked meat (either lean, medium, or fatty), an order of pickles, coleslaw, french fries, and wash it down with a Black Cherry soda. I promise, you will love it and leave so satisfied if you order that perfect combo! Montreal is such a good food city. I will certainly be back to visit this awesome city many, many times!